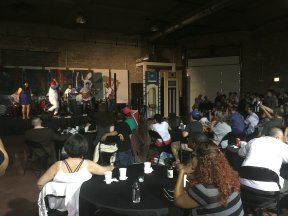 The Puerto Rican Agenda hosted an emergency fundraiser at the Segundo Ruiz Belvis Cultural Center this past Friday Sept. 22nd for Puerto Rico as it was declared a Disaster Area by Category 5 Hurricane Maria. The island is devastated in the wake of Hurricane Maria with limited supply of food, fuel, medicine, and access to clean water. Along with Chicago’s Puerto Rican community, the organization is working together to assist with rescue and relief by hosting their first fundraiser where proceeds will go to The Puerto Rican Agenda Hurricane Emergency Relief Fund. Omar Torres Kortright who is the executive director of Segundo Ruiz Belvis Cultural Center and also active member of The Puerto Rican Agenda contributed to the success of the fundraiser. “It’s called Puerto Rican Agenda because we are trying to push the issues that are important to the Puerto Rican people so Segundo Ruiz Belvis historically has had a role in that group. When they called me and they asked me would I would be interested in helping out and donating the space, of course Segundo Ruiz Belvis said yes, we want to be part of it. The moment that we became part of it, we did it wholehearted,” said Kortright. The fundraiser had a variety of performances such as La Obra Set, Pinqy Ring, Bomba Con Buya, and SRBCC Bomba Group-Arawak’Opia. Also, guest speaker Lt. Governor Evelyn Sanguinetti came to support. 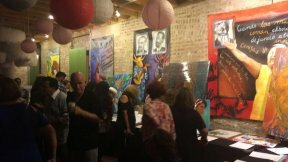 The organization’s goal was to raise $50,000 by the end of the fundraiser and already having a head start raised $30,000 through its partnership with the National Museum of Puerto Rican Arts and Culture donating $26,000 alone. Yolanda Velazquez came to support the fundraiser her family and friends whom she still has in Puerto Rico. “Well I brought in a check, I want to help in any way I can. Since I can’t go to PR, I have family in PR, I was born in PR, the only thing I can do after watching the news. I want to come in and help somehow, and that’s why I am here. This is the worst thing ever,” said Velazquez. Chicago Chapter, National Conference of Puerto Rican Women, a member of the Puerto Rican Agenda helped also in support of the fundraiser. “We worked hard to defend, promote, and educate on the Puerto Rican diaspora, before Hurricane Maria, PR was already going through a lot of problems, you have death crisis, you have the fact PR on the island that are treated like second class citizens, they don’t have the right to vote for the president, they didn’t have the right to say how funds should be distributed. There is weak infrastructure, which was the reason why 100 percent of the island has no power when you get a hurricane like Maria,” said Isabel Sophia Dieppa, media coordinator of Chicago Chapter, NCOPRW. Dieppa wants people to be aware that they are a trusted organization and working with the right humanitarian organizations in Puerto Rico to make sure the funding goes to the right people.